This species is highly regarded among Tangayikan cichlids keepers. It will take some time to get full color, but when at last you get a male that does, you can't refrain from being enchanted and feel that all of your efforts have paid back! Cyathopharynx furcifer is, by all means, my favorite cichlid. I have been keeping them in my tanks for seven years now. The specimens I'm housing right now are the fourth generation from the original trio. Whenever I have the opportunity to watch a pair spawning it's always an emotion hard to explain. This is NOT an easy fish to keep, not because is highly demanding but because often, despite it is well kept and looks fit and strong, males refuse to get full colors. I should add I like challenges. This fish is endemic from Lake Tanganyika where it inhabits at the border between rocky and sandy zones, many species of cichlids are known from this area and the difference in colors are stunning. During courting period males dig big nests using their mouths, they are shaped as "reversed" cones whose diameter can attain 60 cm. (about two feet). Once their nest have been built they begin to swim slowly over them, with their fins in "displaying mode", trying to attract passing females. When finally a willing female approaches the nest, the male, with a fast but unbelievably graceful swimming posture, drives her to the very center of the nest where spawning take place. Eggs number from 10 to 40 depending on female's size. A courting male shows, in my opinion, the most unbelievable colors ever seen in a freshwater fish. According to Paul Loiselle the fish colors closely resemble those in Morpho butterflies, which means that all colors are detectable if, and only if, light reaches the fish with a "given" angle: with Cyathopharynx, best results are obtained when light comes from the front, with an angle between 40° to 60°. That's why a swimming fish looking grey or bluish will, suddenly, enlighten himself with blue or green sparks. Hence, to appreciate "real" colors of this beauty the tank needs to have the appropriate "artificial" light from the top. Unfortunately males have long "inactive" periods when they look like grayish, lazy, sardines ... Expect your friends NOT to believe You when, upon their visit at you home to watch at the "miracle", you tell them about the unbelievable colors your dominant male was showing simply a quarter of an hour ago. Finally here are few suggestions to enjoy to their best these fishes, relying in my own experience and on text listed in bibliography. First of all, despite the increasing offer from retailers, refrain from buying adult (full grown) wild specimens. Males frightened by the long trip and all other troubles associated with collecting will hardly regain their original colors. It is much better to begin with a group of youngsters fro aquarium origin that at 10 cm (4 inches) in T.L. will start to compete among each other and display their colors. Keeping many males in competition increase the spawning chances. A 600 liters tank (with three or more males) is a really suitable layout, of course you need many more females. This fish attains a T.L. of 16 to 18 cm. (6-8 inches) and it is easily bullied by messy tankmates, thus it is better to avoid genus like Petrochromis, Tropheus, Ophthalmotilapia or Cyprichromis species jumbo as tank companions. Aquascaping of the tank should count with plenty sandy zones suitable for digging nests, while rocks should divide the tank in separate quarters, allowing each male to establish a territory and choose his spawning partner(s). Feeding is extremely important: Cyathopharynx are easily overfed with any sort of food. It is better to avoid feeding meals too rich in proteins even if this will result in specimens reaching their full size at 18 months of age that will only remain in good health till about four years. Finally offer your fishes a water with chemistry values as close as possible to those in their natural environment (A common recommendation with any Tanganyikan cichlid anyway. Finally some tricks from my experience: slight environment variations (more frequent water changes and/or water temp changes) will encourage spawning activity. The same can be achieved by changing the lighting period or the aquascaping, even adding another male (in case we have only one in the tank) will do. But, finally, absolutely unavoidable is a consistent amount of time!!! Refer to bibliography to get more information on natural living and breeding conditions and to get to know the huge number of geographical variations living in wild. If given the opportunity do not miss the tape "Hidden African beauties" by H. W. Dieckhoff, showing Cyathopharynx furcifer in unbelievable beauty. Hacard J. P. (1993) Un Cichlide de rève. Aquarama vol n°129 ­ 1 ­ 93 pp 9 ­ 15. Strasbourg, France. Konings Ad (1988) Tanganyikan Cichlids. Verduijn Cichlids & L. F. M.. Zevenhuizen. Holland. Konings Ad, Dieckhoff H. W. (1992) Les Secrets du Tanganyika. Africa. Marseille. France. Konings Ad, (1995) Fairytale cichlids of the genus Cyathopharynx. The Cichlids Yearbook vol. 5 pp 6 ­ 9. Cichlid Press. Schupke P., (1992) Nach Wie vor faszinierend i Cyathopharynx furcifer. Datz 7/92 pp 423 ­ 426. Stuttgart. Germany. 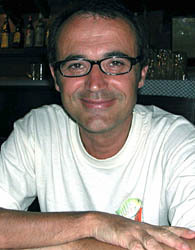 Salvagiani, Paolo. (July 02, 2002). "Cyathopharynx furcifer Burundi". Cichlid Room Companion. Retrieved on April 19, 2019, from: https://www.cichlidae.com/article.php?id=168.